Dim sum along with other traditional Chinese dishes in Studio City. 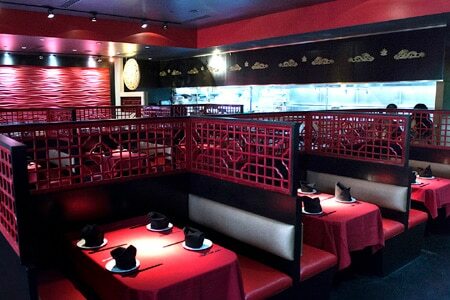 : Shanghai Rose is a real rarity in the San Fernando Valley --- a restaurant that serves dim sum. It’s a striking space, decorated boldly in red, black and gold. Watch the chefs in the open kitchen as they prepare Chinese standards like kung pao chicken, or dishes from what they call their new "gourmet menu." It features options such as drunken fish --- poached sole in white wine and ginger sauce on a bed of black mushrooms --- and filet mignon with green curry. Dim sum is served seven days a week, but if you want traditional cart service, come on a Saturday or Sunday. Dozens of varieties are offered, among them pork shu mai and spinach and shrimp dumplings. For dessert, try the mango pudding, coconut jello or lychee nuts in syrup. A selection of well-priced wines and beers is available.